Ray Bradbury was an outspoken supporter of libraries throughout his career, and the following letter to the assistant director of Fayetteville Public Library — in which he explains the race to write the novella upon which Fahrenheit 451 was eventually based — perfectly illustrates why. 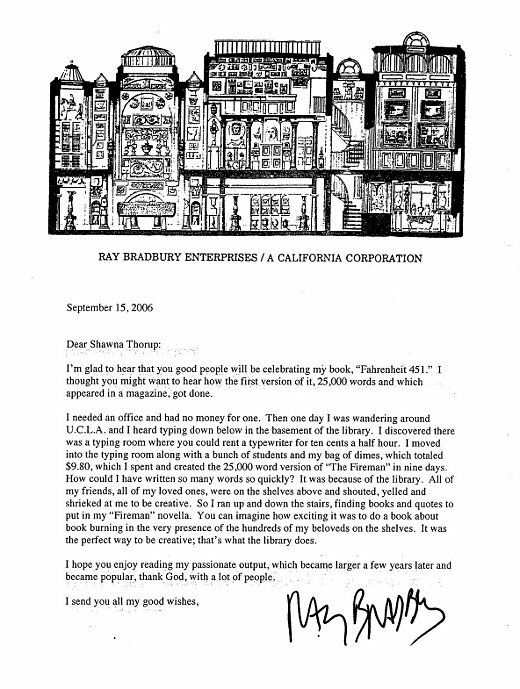 The letter was written in 2006 in response to a city-wide "Big Read," in which Bradbury's classic novel was studied. I'm glad to hear that you good people will be celebrating my book, "Fahrenheit 451." I thought you might want to hear how the first version of it, 25,000 words and which appeared in a magazine, got done. I needed an office and had no money for one. Then one day I was wandering around U.C.L.A. and I heard typing down below in the basement of the library. I discovered there was a typing room where you could rent a typewriter for ten cents a half hour. I moved into the typing room along with a bunch of students and my bag of dimes, which totaled $9.80, which I spent and created the 25,000 word version of "The Fireman" in nine days. How could I have written so many words so quickly? It was because of the library. All of my friends, all of my loved ones, were on the shelves above and shouted, yelled and shrieked at me to be creative. So I ran up and down the stairs, finding books and quotes to put in my "Fireman" novella. You can imagine how exciting it was to do a book about book burning in the very presence of the hundreds of my beloveds on the shelves. It was the perfect way to be creative; that's what the library does.